Canada’s sun-deprived northerly latitudes mean 90 percent of Canadians will be vitamin D deficient in the winter. That’s why it’s not surprising that regular sunbed users have the highest vitamin D levels of any group in Canada. According to Canadian research published in the journal Public Health, by Edmonton vitamin D researcher Dr. Gerry Schwalfenberg, regular sunbed users and those who take high-dosage vitamin D supplements, have the highest vitamin D levels in Canada. Those who do not take supplements and who report receiving minimal sun exposure had the lowest vitamin D levels. 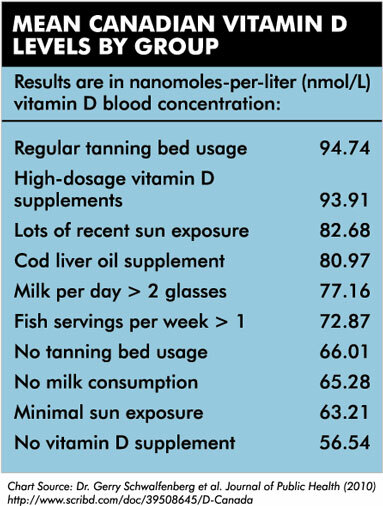 Vitamin D researchers now recommend target vitamin D levels — measured by blood concentration in a vitamin D blood test — of 100 to 150 nanomoles-per-litre. (www.D-Action.org — a panel of 41 of the world’s leading D researchers). The paper by Dr. Schwalfenberg — who has no relationship with the Canadian tanning community — is in line with other studies on this topic. A study on vitamin D and tanning published in the American Journal of Clinical Nutrition in 2004 showed regular sunbed users in the United States had 90 per cent higher vitamin D levels as compared with non-tanners. A single sunbed session can trigger the production of up to 20,000 IU of vitamin D in the skin in a single visit — 200 times what is present in an 8-ounce glass of whole milk. JCTA’s Gilroy — whose own vitamin D level measured 122 nmol/L at the end of the 2011 winter earlier this year as a sunbed user and dropped 43 per cent to deficient levels by the end of summer, during which he stopped tanning and followed health authorities’ vitamin D recommendations — points out that professional sunbed centers in Canada teach moderation and sunburn prevention. To read the JCTA press release click here. © 2017 International Smart Tan Network. All rights reserved.